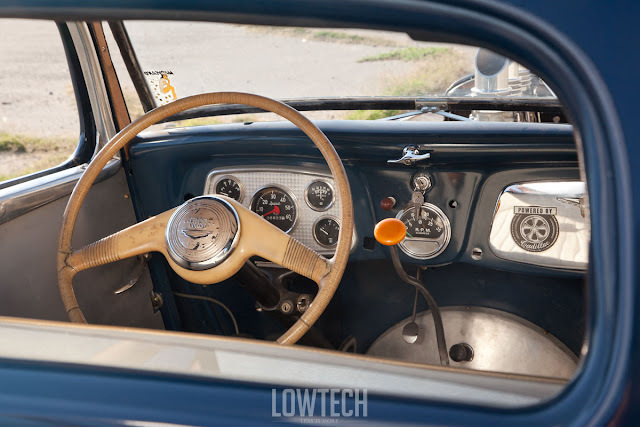 Ever since the early days of hot rodding, the media have played an important role in spreading the gospel of hopped-up jalopies and turning a pretty much local phenomenon into a nationwide movement. 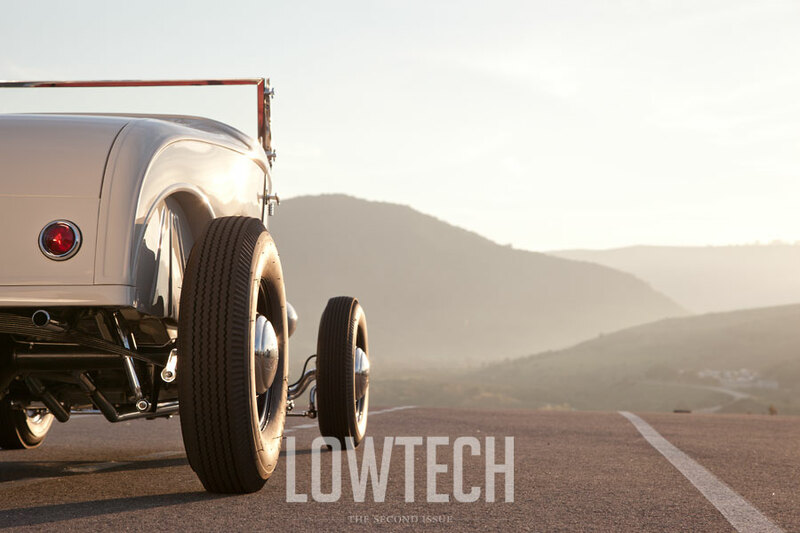 Every month and all over the U.S., young hot rodders were anxiously awaiting the arrival of the latest issues of their favorite hot rod magazines filled with the newest trends in the hobby. Southern California, by far, was the hotbed of hot rod culture and it had a huge influence. Nevertheless, local build styles were starting to evolve and some of the most significant differences could be seen between the builds from the East Coast and the West Coast. One commonly known feature of an east coast build is the channeled body in combination with an unchopped roof. The resulting proportions are not up to everyone’s taste but a lot of guys dig exactly that kind of look. 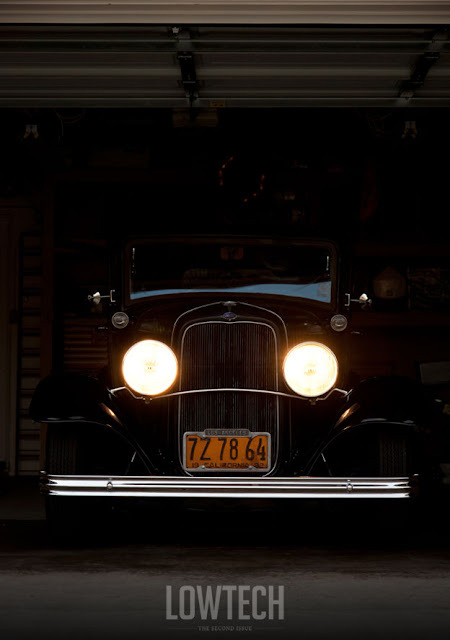 And since authentic looking, period-correct cars kept getting a lot of attention during the last couple years, those east coast style cars have a strong standing next to the popular west coast style. 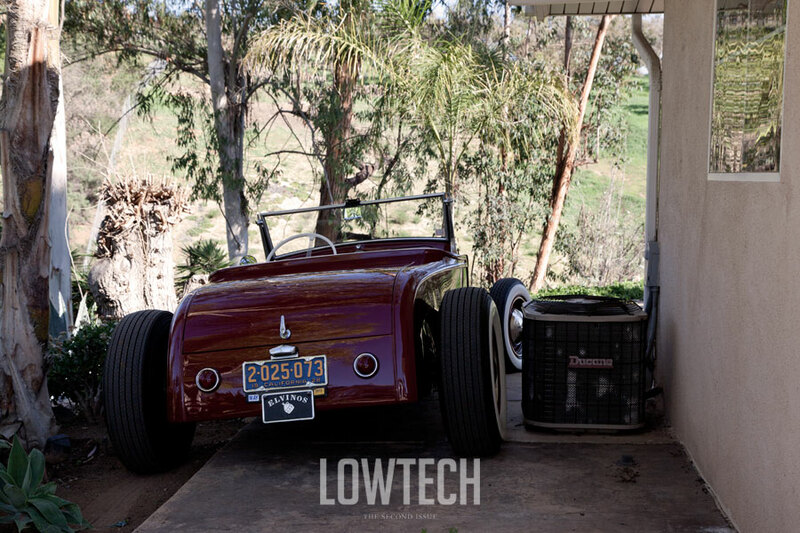 Matt and Isaac started looking at bodies and cars but everything they came across was built of fiberglass or street rodded material. Finally, they stumbled upon a '34 in Maryland that was built by Jason Sheets. Matt had been following Jason's bikes and hot rods for some time, as he has a great eye for period correct parts and great vintage builds. Jason’s '34 Coupe was no exception. 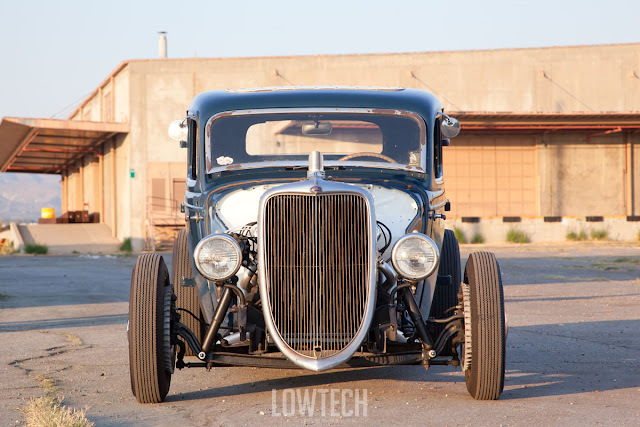 It was close to exactly what Matt and his buddy were looking for so they worked out a deal and shipped the '34 to California. Matt and Isaac both sold their bikes that they had built under their company Fleetside61 to fund it. 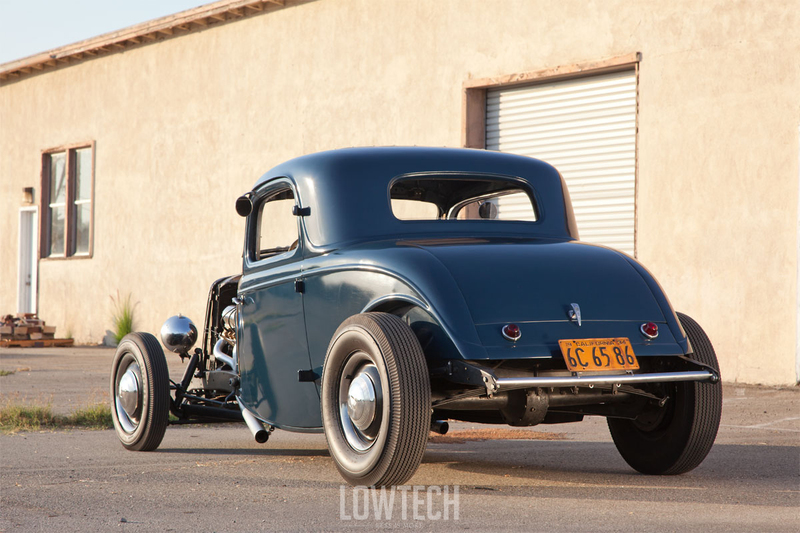 Jason Sheets had done an amazing job making the Coupe look like it’s an old build. And indeed there’s a little bit of local hot rod history hiding in this car. 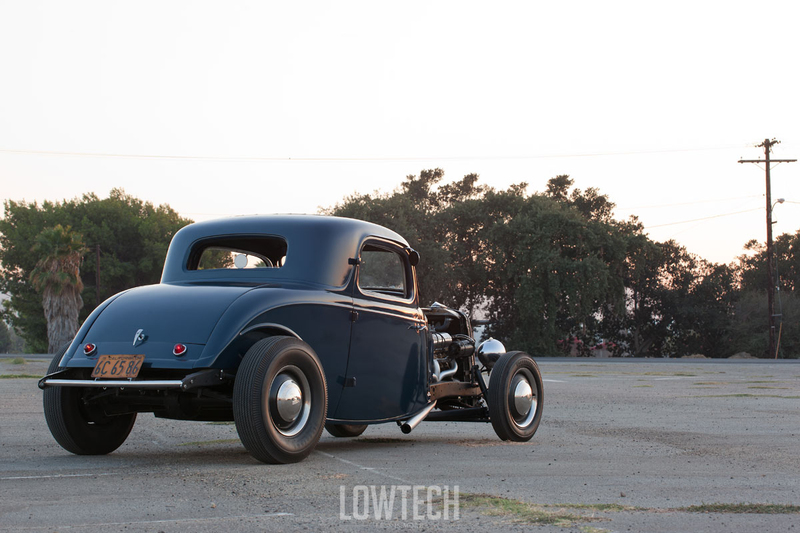 Like so many three window coupes of the era, the ’34 Coupe originally was supposed to become a dirt track racer. But instead of making laps on a dirt oval track it was just rusting away in a field until 1960 when it was rescued. But still, nothing happened to the three-window coupe and it went from one hot rodder to another. Jason finally found it through an ad he had seen in the local newspaper. When he got it the lower 6 inches were missing and the body was held together by two pieces of the roof and the doors. Luckily the frame was in ok condition. Jason knew this was the only way he could get his favorite year Ford, so he had to bite the bullet. 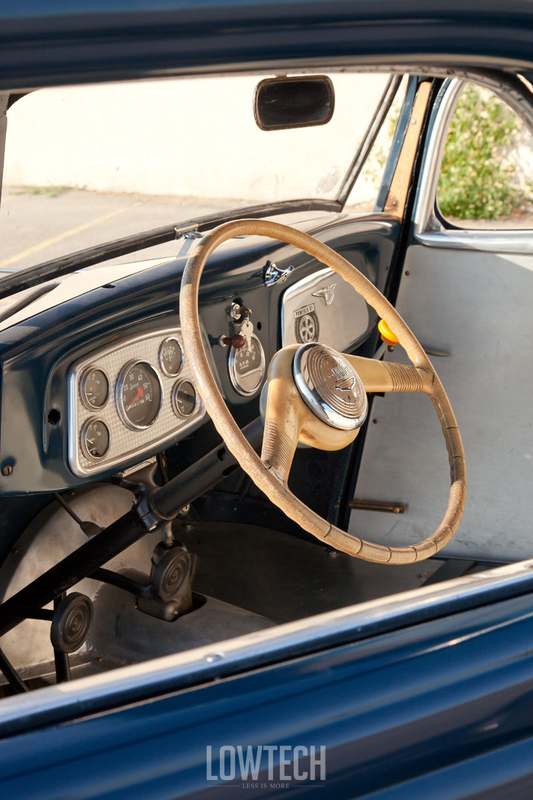 In order to prevent the body from falling apart while getting sandblasted, he built an inner structure. When he got it back from the blaster, Jason started reconstructing the missing sheet metal from the bottom up. There was no floor anyway so he decided to channel the body over the frame. The roof was left unchopped. 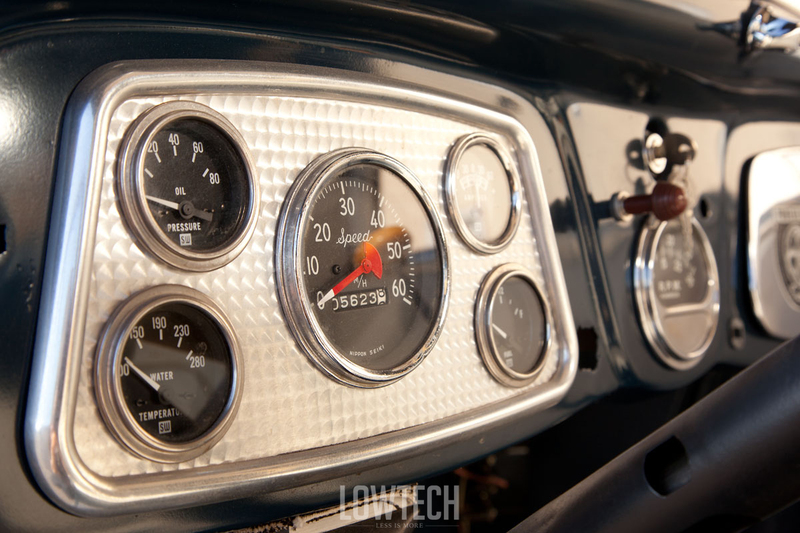 Jason already had accumulated a stash of interesting period hot rod parts that found their way onto his 34 Coupe project. One day while Jason was at his shop, an old dude stopped by. He was looking at the hot rod project and mumbled something like he might have an engine for Jason’s hot rod. 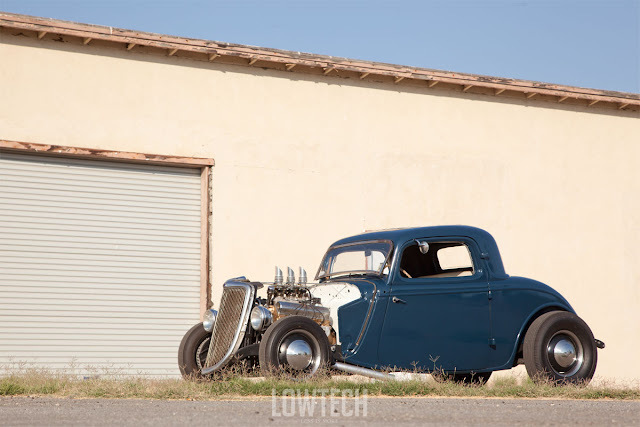 It turned out he actually had a 1940 Lincoln Zephyr he was going to build into a street rod. The old Lincoln didn’t have its V12 anymore but a ’55 Cadillac 331-ci engine, so Jason got ahold of the old Caddy mill. It was covered with grime and grease but after a thorough clean-up some cool old chromed parts re-appeared, like the valve covers, the fuel pump and the valley pan. The engine received new gaskets, a new main seal and a fresh coat of gold paint. 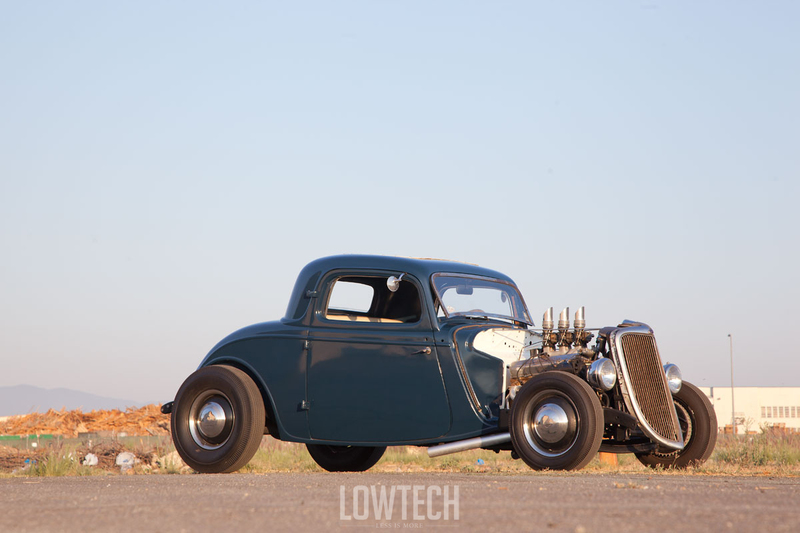 In order to fit it into his Coupe, Jason had to notch the firewall and modify the radiator. 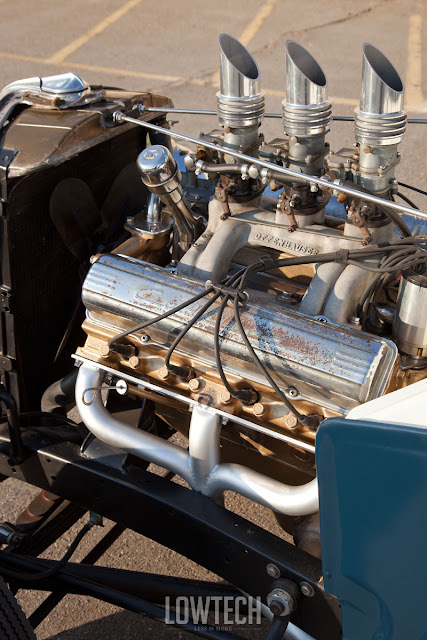 The Edelbrock triple-carb setup was added along with some rebuilt Stromberg 97s. Jason also made a nice set of headers from 1936 Ford torque tubes. 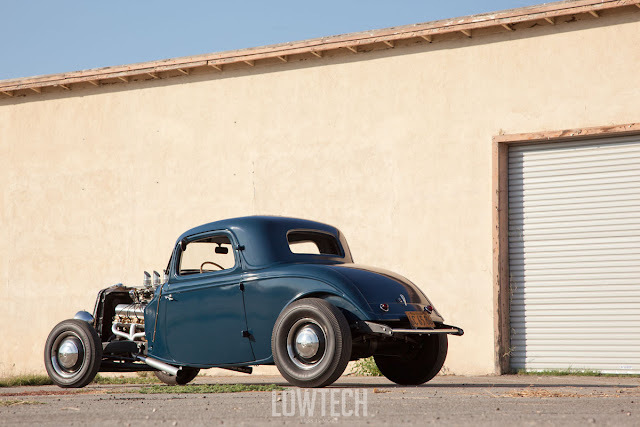 When Matt and Isaac got the 34 Coupe in 2012, they did what should be done with any running hot rod: They drove the hell out of it. 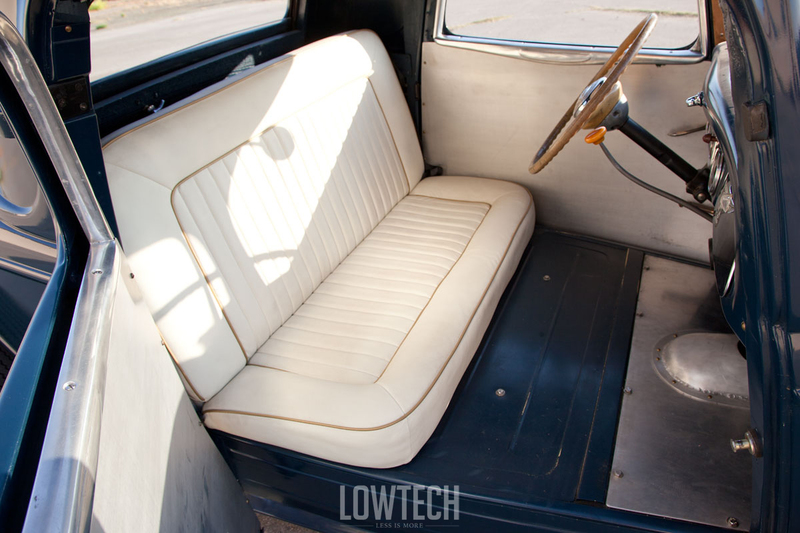 But they also wanted to change a few things: »We had a great little white tuck and roll seat built with gold piping so we could fit in it better. 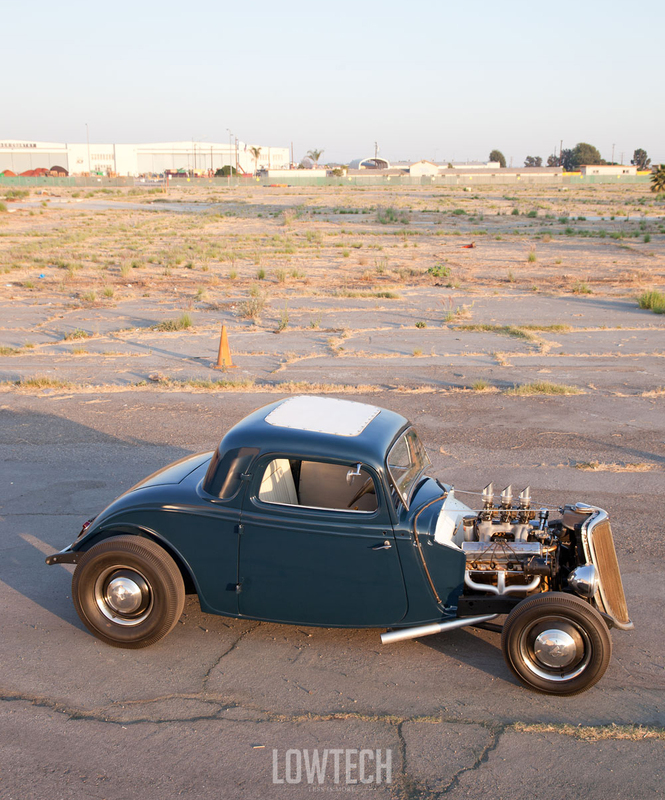 And we pulled the rear end and changed the gears to make it faster off the line.« They got it all finished up just in time to take it to the 2013 Grand National Roadster Show where it was accepted into the suede place. And even better: They ended up winning a trophy from the Thee Inland Emperors Car Club. So, it definitely seems like the east coast style has successfully made its way to the west coast, right? Update: The car has been sold since and now resides with its happy new owner. 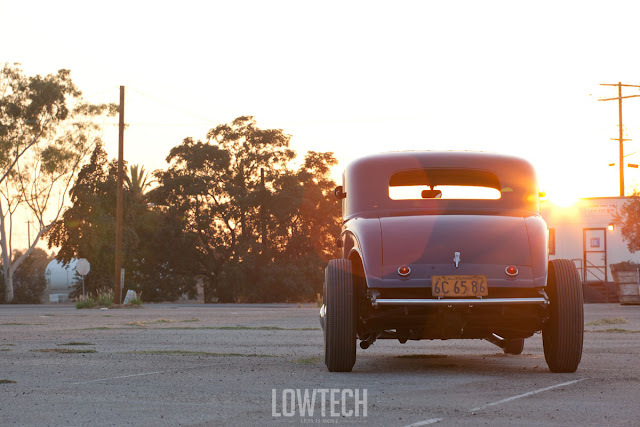 And it keeps enjoying the hot rod friendly climate of the west coast.